Beat those headlice! Hedrin 15 is a fast acting, proven solution that takes only 15 minutes to work! A gel formulation containing Dimeticone and Penetrol® offering a thicker gel formulation to penetrate and kill headlice and their eggs. With no combing required, this skin friendly headlice treatment can be used from 6 months of age so ideal for the whole family. No odour and suitable for sensitive skin, Hedrin 15 requires two 15 minute applications, seven days apart. Apply – Leave 15 minutes – Wash! I’ts that easy! Available from Life, Unichem, Countdown Pharmacies and leading pharmacies nationwide. 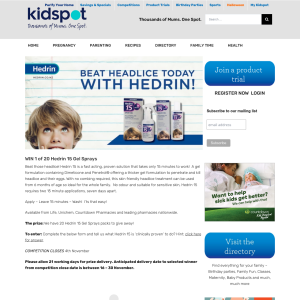 The prize: We have 20 Hedrin 15 Gel Sprays packs to give away! To enter: Complete the below form and tell us what Hedrin 15 is ‘clinically proven’ to do? Hint: click here for answer.